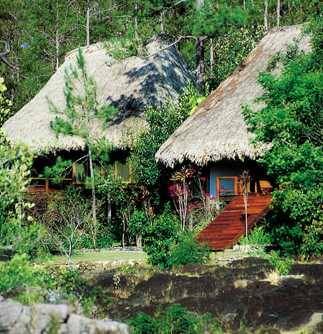 Located in the Mountain Pine Ridge area, largest protected area in Belize, Blancaneaux Lodge was originally built by Francis Ford Coppola as a private retreat. Accommodations are provided in cabanas carefully designed with local hardwoods, pimento sticks, bay leaf thatched roofs, and richly varnished mahogany interiors. Each cabin is equipped with private bathroom with hot water, ceiling fans, verandas and hammocks. The Two-Bedroom Villa has a full bathroom, and the spacious Family Cabana is well-appointed with a large table, a queen-sized bed and two additional beds, a large, screened-in porch and hammock overlooking the gardens. Other Cabanas available include: Riverview Cabana, Gardenview Cabana and the Honeymoon Cabana. The lodge also offers a restaurant, bar, stargazing deck, bike rental and gift shop.